Today I have a birthday card for you. I made it for a dear crafty friend. I used different sizes of foam tape on the octopus arms. 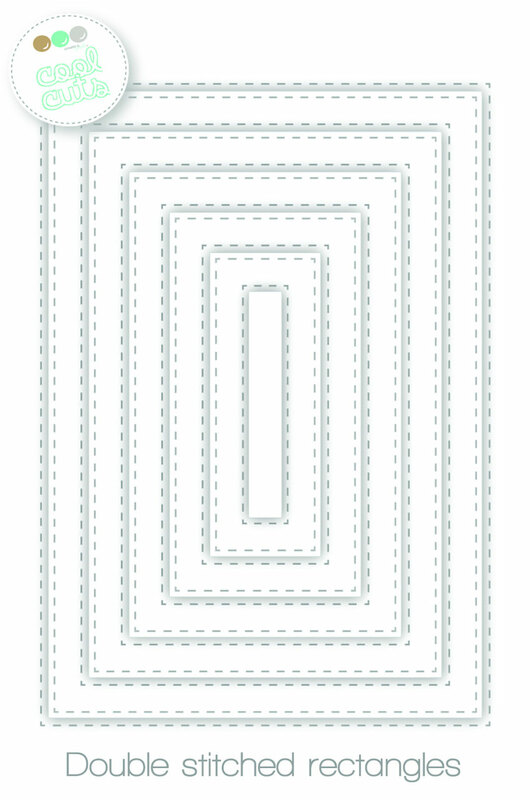 This way you get a fun look of dimension. And hey, bulgy eyes add so much fun to your critter, right?! I don't know if you heard it but Christine was in hospital last week. So I wanted to make a card for her. I knew I wanted to make a Get Well card but also I wanted to use the super cute new stamps. So I went with Wagen voller Schätze/Cart full of treasures and filled the cart with images from the set Doctor's Helpers. I created the background using my new love Distress Oxide inks and a LOT of water. To give the cute koala and his cart a floor to stand on I masked of a stripe and ink blended some dark ink. After arranging the images on my card I felt like something was missing on the top of the card. So I added another eyecatcher with a little more conspicuous sentiment. I cut two banner shapes, stamped the sentiment on one of them and added a bow out of twine. Hi crafty friends and welcome back to our crafty space. 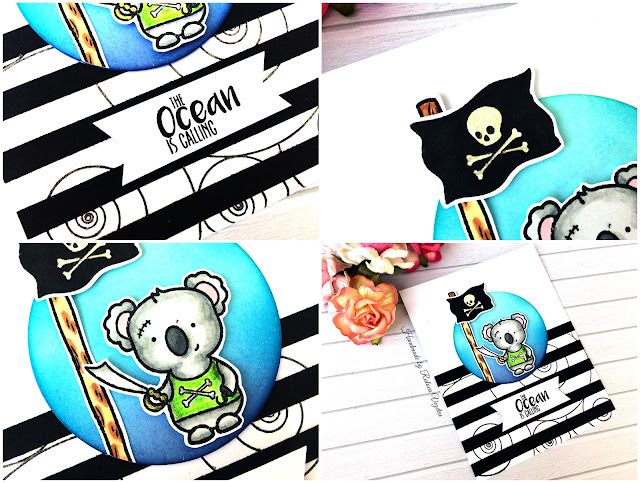 Raluca here with a new card showcasing the adorable "All hands on deck" stamp set. I wanted a bold looking card and using a lot of black and white and just a small part colored with bold colors seemed the best idea! O a white panel I stamped in black the Sophisticated Shells cling stamp, but only on the bottom half of the panel. Next, I trimmed 5 strips of black cardstock and glued them over the stamped part, leaving space between every strip. Next, I die cut a white circle and ink blended 4 blue Distress Inks and added the circle to the panel. Then, I stamped, colored and fussy cut the images and glued them to the circle. I stamped the sentiment on a piece of white cardstock, trimmed it down and adhered it to the panel and the card was done. Well the vacation is over and the school starts again so we are back in bussiness and creating. So here is another card I would like to share with you. I don't know about you but I really love all those flowerstamps. They are so versatile you can color them, emboss them, use watercolor or simply stamp them onto your project. Here I used white embossingpowder on vellum and copic colored the flowers. I used a horizontal cardbase and cut a panel out of whitw cardstock slightly smaller then the cardbase. I used a stencil for my background embossing and also a pierced oval die. I diecut a smaller pierced ovaldie and adhered it to the panel after I randomly stamped some flowerimages. I stamped the flowers on vellum using watermark ink and white heatembossed them. I colored the flowers with copic markers and adhered them to the panel. Stamped the sentiment onto a white banner and to finish of the card I placed some Pearls in the hearts of the flowers. Botanical Love, In Bloom and Lights on. Try to combine the different flower stampsets and you'll be surprised how versatile they are. 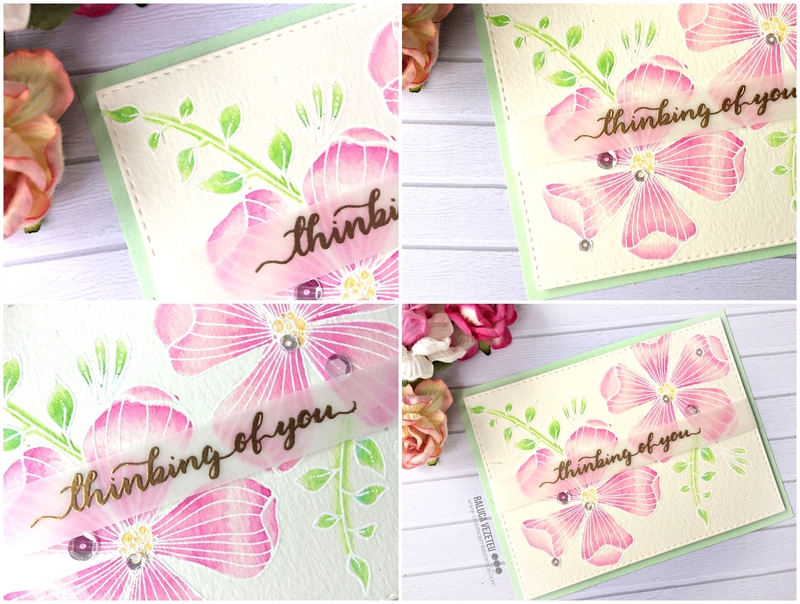 You can also incorporate sentiments from other sets and you will have a very different card. 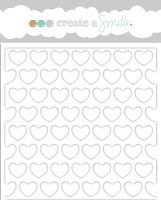 About the different stencils try to use them in another way you can easily use them to emboss your papers. You first have to experiment a little to figure out which sandwich you have to use for the different diecut machines and which effect you will get and like. If you use copics to color your embossed vellum flowers Always color at the backside of your images otherwise you will ruin your copics. 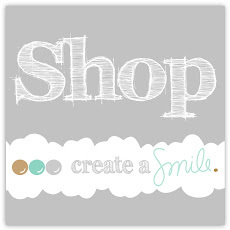 Please visit the create a smile stamps shop if you haven't done already to see all those lovely new stampsets for the month august and as Always we love to see what you create. Hey all! I am especially excited to share this card because I'm using the new floral stamp :) I love floral stamps and I can have a room full of them hehe. Floral stamp sets are probably one of the most versatile stamps set. You can use it for basically any occasion. One of my favourite ways is to put flowers in a shape. I've die-cut a heart shape first. You can use any shapes you want. 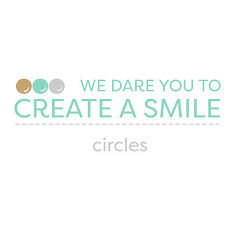 Circles, triangle, square, cloud, or even a coffee mug shape. Then, take your flowers and just fill the shape in. I've started with my biggest flower first and fill up with tiny images. I brought out my trusty prima watercolours to colour the florals. Then, I've loosely, drop a of blue to have that background. 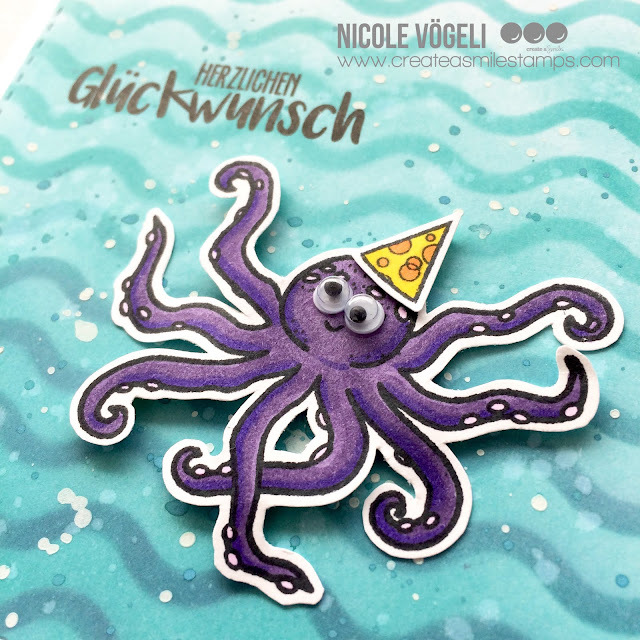 Add your sentiment and a little bit of stickles to finish up the card. 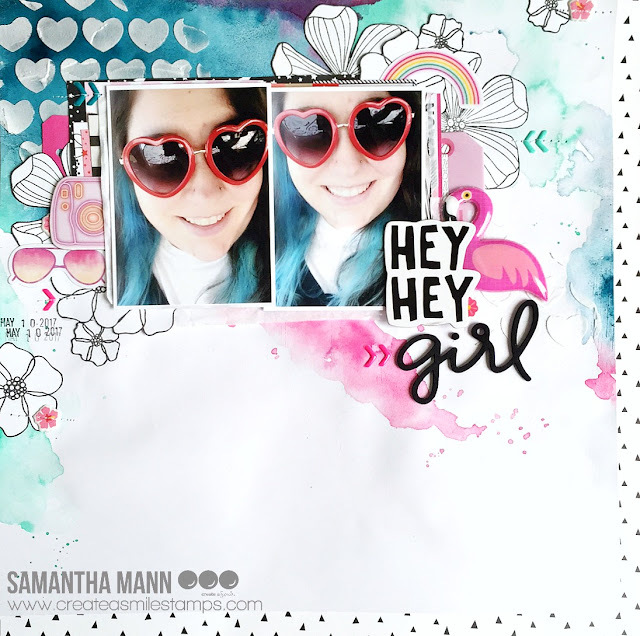 Samantha here, and today I'm sharing a layout I created! What?! Well, I was bit by the scrapbook inspiration bug when I went to create a project! So this is what happened! ha! Lots of mixed media, and lots of color! Love it! - once *that* step is dry, you can use the stencil and some embossing paste to add texture! - while everything was drying, I stamped the flower images multiple times in black ink and then fussy cut them out. - I love how the colors are bold, and so they let the flower images really stand out, as the 'white' space! 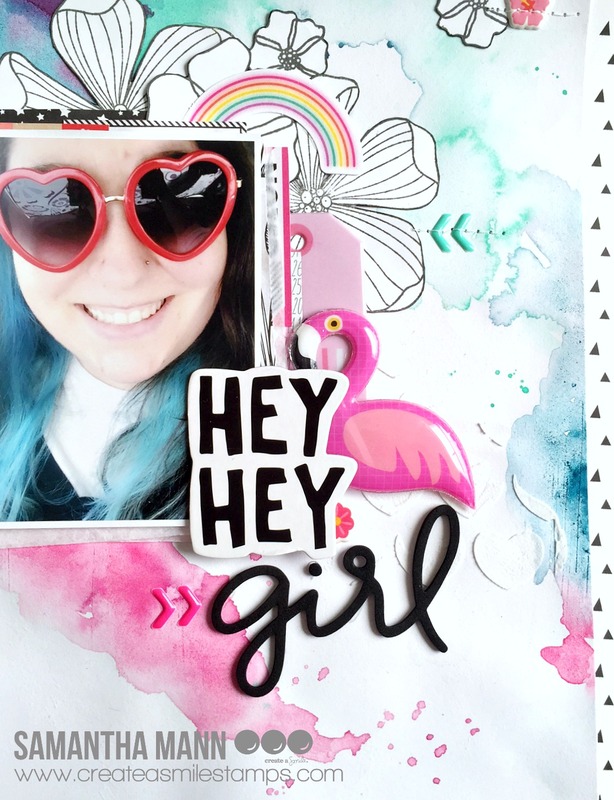 Not a scrapbooker? That's ok! The same background could be adapted and used for a card! To create this layout, I used the brand new In Bloom stamp set, along with the Clear Magic Flowers stamp set! 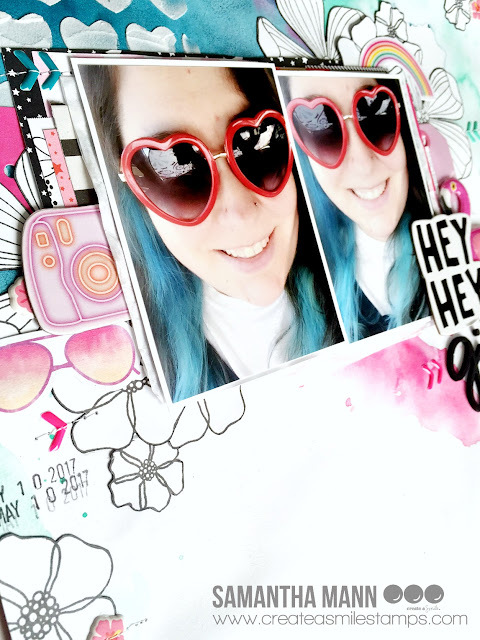 I used the Big Hearts Polka stencil to add some texture to the background! I also used some of the Enamel Stickers that Create a Smile Stamps sells! I LOVE THEM!! They have different shapes and colors in each pack!! I can't get enough of them!! You may have already heard that Christine is in the hospital right now. She is recovering slowly but she is still very ill. Send here some get well wishes! So I am here to announce the winner of the Blog Hop Giveaway and it is.... Jane! Please contact us to get your prize! We hope you enjoy! Thanks to everyone who joined the fun of our Release party! Next week I am back from vacation and will show you what I've done with the great new stamps! Hi crafty friends and welcome back to our crafty space. 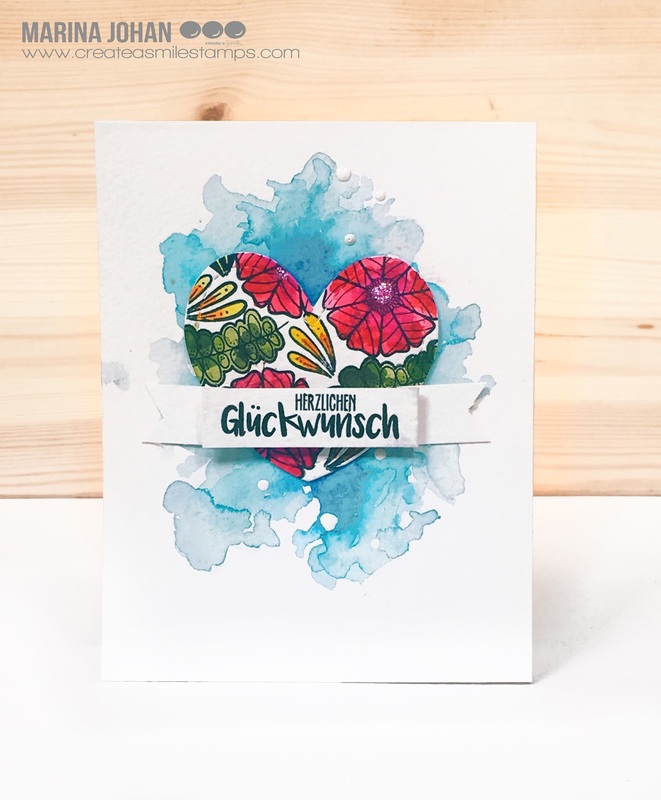 Raluca here with a new card showcasing the new and gorgeous "In Bloom" stamp set. I just love this new set and I wanted to make a watercolor card. First I prepared a panel from watercolor cardstock. Next, I stamped the images in VersaMark ink and white heat embossed them. Then I started watercoloring. After I was done with the coloring I stamped the sentiment on a strip of vellum and gold heat embossed it. I attached the strip to the panel and I mounted the panel on a light green card base. This is our COMEBACK Party!